For nearly 50 years, Loveland Performing Arts has been bringing world-class, professional entertainment to Loveland and the Front Range. This tradition continues in 2018-19 with a stellar array of artists providing outstanding entertainment for your listening pleasure. From the Boston Brass to The Jersey Tenors, we have something for everyone. You won’t want to miss a single show in this spectacular line-up! We’re excited to share this year’s offerings with you. Enjoy the shows! 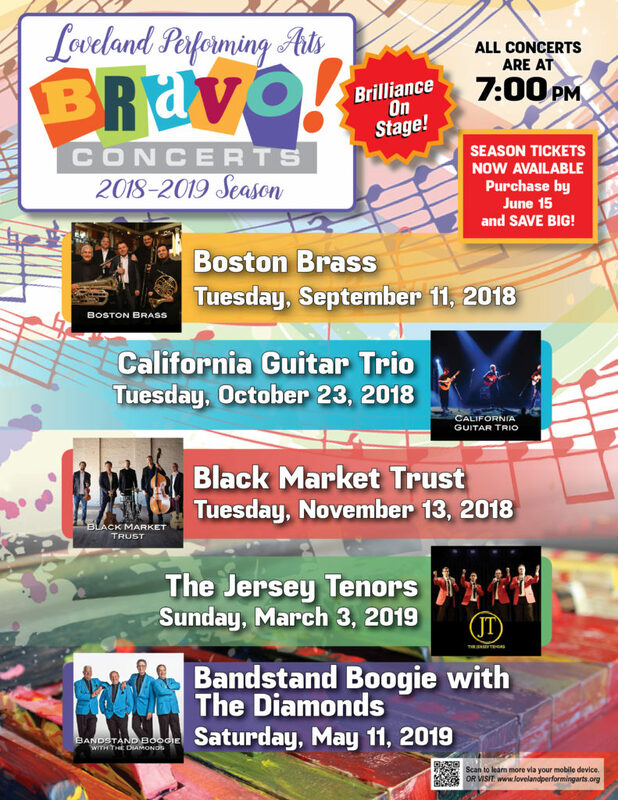 BANDSTAND BOOGIE WITH THE DIAMONDS, MAY 11, 2019 7:00 P.M.
Tickets for individual shows can be purchased on the website for $20 for adults and $5.00 for students. They can also be purchased at the door for $25.00 for adults and $5 for students.